In a recent interview for the Italian magazine L’Espresso, former finance minister of Greece Yanis Varoufakis announces the formation of a new Pan-European movement in February 2016, with the aim to democratise the EU, rather than working for its dissolution. Why was the anti-bailout left defeated in the Greek elections? Yesterday’s piece on Jacobin by Panagiotis Sotiris is an insightful analysis of the disappointing result of the anti-bailout left movement Popular Unity (the Syriza rebels) in Sunday’s Greek elections. The writer is a member of the movement and makes some good points. The main one, which I very much agree with, is that Popular Unity failed to articulate a clear alternative to the bailout – in other words, the problem was not so much that they supported Grexit, but that they didn’t make it clear enough if they did so wholeheartedly, and what their plan for such a transition would be. Popular Unity’s bad performance and KKE’s ambiguities on similar issues (and their declining support in the polls) are very worrying signs for the future. It means that at the moment there is no strong left alternative to the troika’s agenda in Greece, ready to steer the country if (or should we say when?) the new government will fail to convince its voters that the bailout was the “lesser evil”. And of course the resonance of this defeat reaches well beyond the boundaries of Greece. Tsipras’ victory is also a serious blow to the repositioning of a radical left throughout Europe (especially southern Europe) towards a clear alternative to the undemocratic rule of technocracy. Given the good performance of the neo-nazis in Greece and the general rise of far right fundamentalism throughout Europe, it is a rather disturbing fact that the most vocal and growing opposition to technocratic rule comes from chauvinist xenophobic movements. There is no doubt that Tsipras won his bet last night, with the rebels of Popular Unity failing to make it to parliament, and by maintaining a striking 145 seats in the parliament – Syriza won 149 MPs in the January 2015 elections. The fact that, despite a major drop since January, his junior coalition partners – the xenophobic nationalists of Anel – were able to gain 10 seats was also a big plus. He can now keep the same coalition and avoid the “pact with the devil” with old parties like Pasok, or the unashamedly pro-troika pro-oligarchs new formation of To Potami. But speaking of Tsipras’ “triumph”, as many have done, is rather short-sighted and does not really capture the essence of the significant changes in the political arena that this election has marked, only 8 months after the previous one. One thing is clear: the only indisputable winner is abstention. 4,274,000 people stayed home, 43.4% of eligible voters. This makes it the lowest turnout in the history of Greek parliamentary elections, with 7% less than the January elections. The ranks of those who stayed home swelled with an additional 764,000 people. This of course doesn’t detract from the negative performance of anti-bailout left parties like Popular Unity, that did not even make it to parliament, and KKE, which maintained the same number of seats as in January (15), but lost many votes on the way. The truth is that most parties lost voters, but some more than others. And here is the key to read this election: it’s not so much Tsipras’ victory, but a bigger defeat of his opponents. 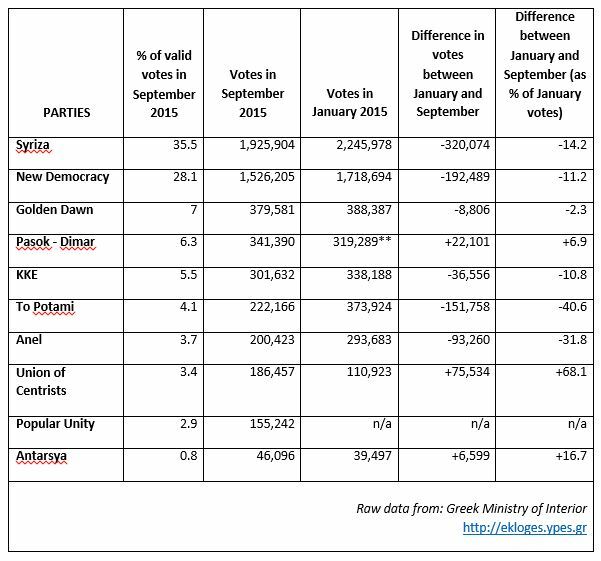 Syriza lost 320,000 voters in just 8 months. That’s a decline of 14.2%, which is significant. Comparing the percentage of cast votes, Syriza appears to have lost less than 1% (from 36.4% in January to 35.5% on Sunday). But a much more accurate portrayal is the percentage over the total registered voters: in January, it was 22.6%; on Sunday it came down to 19.6%. That’s a considerable drop of 3% in just 8 months. Their main opponents, the conservatives of New Democracy (ND), lost 192,000 voters, a decline of 11.2%, thus not posing a real threat to Tsipras, despite most opinion polls giving the two parties neck-to-neck before Sunday – it’s quite likely, as it happened in the past, that the media oligarchs preferred to boost ND numbers and underplay Tsipras’ strength. These numbers also show that anti-bailout left parties did not pose a serious threat either. The Greek communists of the KKE, who had disengaged from the bailout referendum in July and kept a critical distance from the debate around negotiations with the troika, lost 36,000 voters. This is a significant number for a small party, equivalent to a decline of 10.8% of total votes since January. Popular Unity, which benefited from the visibility of being in government in the previous months and at the centre of the bailout drama, also failed to capitalise on the ‘no’ overwhelming victory in July. Assuming that they intercepted discontented Syriza voters, they captured slightly less than half of the voters who abandoned Syriza, and missed the 3% bar to enter parliament by 8,000 votes or so. It is easy to interpret the poor performance of the two major left alternatives to Syriza as a further proof that Greeks might have issues with the bailout, but prefer to stay in the euro. In fact, one could argue the opposite. KKE made it clear that they were not contemplating Grexit. So while their principled opposition to the bailout in parliament was not in doubt, many might have wondered what kind of alternative they could really provide within the eurozone. Popular Unity, which started its campaign with very strong messages about Grexit, gradually diluted their position as the campaign unfolded. I think another factor that played against them was having been in government just until few weeks before. Those who have not forgotten the betrayals of two mandates (the January election and the July referendum), would have struggled to trust Popular Unity’s promises. Tactically, their dangerous engagement with nationalist rhetoric (including a rather cold and ambivalent position on refugees) might have failed to achieve much in electoral consensus, with Tsipras ‘moderate’ patriotism being a better rehearsed script for left-oriented audiences, and the xenophobic nationalism of Golden Dawn sending clear, if disturbing, messages about the need to cater to “Greeks only”. On the far right front, Anel’s xenophobic rhetoric did little to stop its decline – they paid a much higher price than Tsipras for their entry into troika mainstream politics. They lost 93,000 votes since January, a 31.8% decline. Golden Dawn on the other hand maintained a strong performance, and remains the third party in Greece. They lost only 9,000 votes (-2.3%). Given their judicial troubles and the admissions of political responsibility over hate murders by their leaders, their result remains a major worry. Perhaps the only positive factor is that they don’t seem to have gained from the general decline of the two major parties – thankfully, people decided to stay at home, rather than supporting the neo-nazis. The only two parties in parliament that gained votes in this round are Pasok and the Union of Centrists. Pasok allied itself with Dimar. Together they gained 22,000 voters over their aggregate performance in January (+6.9%). Only a comprehensive analysis of the micro-data at district level can tell us something more conclusive about this trend. It is possible that some former Pasok voters who supported Syriza in January, have now come back to Pasok. Leventis’ Union of Centrists is probably the only party that is fully entitled to celebrate Sunday’s results. Its party gained 75,000 voters, a staggering 68.1% increase from January. It is telling that a party broken by judicial scandals (Pasok) and another one that has always been seen as a kind of ‘joke’ for running too many elections without ever making into parliament, are the only ones gaining votes. It is certainly another symptom of systemic crisis in the Greek political arena. Finally, another sign that the narrative of an “overwhelming” victory of pro-bailout parties doesn’t hold is the collapse of pro-troika pro-media To Potami. They lost 152,000 votes since January (-40.6%). If there was any overt support on the ground for the way things unfolded since Tsipras’ capitulation to the creditors’ demands, then To Potami should have been the first to benefit. Despite Syriza’s considerable decline, Tsipras remains firmly in control over the levies of power. The number of votes he lost was perhaps less than expected, given that he faced a relentless campaign from those who felt betrayed by the new bailout, but also the experienced politicians of New Democracy, which were waiting for the first opportunity to get back into power. Let’s not forget the main reason for calling the elections so quickly: the impact of the new bailout measures approved so far has not yet been felt by the wider populace, and there are many more harsh measures still to be approved as part of the troika agreement. Pressure from Brussels and Germany has far from eased. The creditors want to see more cuts and liberalisations in the next few weeks. Will Tsipras and his party survive the full weight of the bailout? Certainly the electoral results favour both Tsipras and the creditors. Tsipras can push parliamentary support for the bailout without having to enter into a formal alliance with the old “corrupt” parties he has been attacking over and over again in the last campaign. He thus maintains face, while toeing the troika’s line. He was also able to get rid of the most vocal rebels, something that both he and the creditors must be very relieved about. But a majority of 155 seats between Syriza and Anel, means a margin of only 4 votes, and there will be many controversial measures that will be difficult to pass with these numbers. This is far from a stable arrangement in a country that has gone through five elections in six years. It took less than three years for the old main parties Pasok and New Democracy to see their voters nearly halved or more. In October 2009, Pasok won the elections with 3,012,000 votes (43.9% of valid votes); New Democracy came second with 2,296,000 votes (33.5%). In May 2012, Pasok’s consensus had collapsed to 833,000 votes (13.2%); New Democracy came first, but with slightly more than half of 2009 votes, a meagre 18.9% of valid votes. The new bailout signed by Tsipras ends in less than three years time. Could it be the deadline of his demise? *Please note that there are other smaller parties which ran in the elections that make up 1.5% of the total registered voters. I don’t have information to evaluate their stance on the bailout, they are likely to be a mix of both pro- and anti-bailout. Of the parties that did not make it to parliament, I have counted Popular Unity and Antarsya as anti-bailout. **Pasok and Dimar ran separately in January, the figure refers to the aggregate of the two parties. Greece has a new government: will it last? Formalities will be announced later, but everything signals towards the continuation of a coalition government between Syriza and the Greek nationalists of Anel. Their leaders, Tsipras and Kammenos, have just hugged on stage as they celebrate the victory and address their supporters. With 60% of votes counted, they would obtain 155 seats together, enough to secure the absolute majority in parliament. This is 7 seats less than in the previous elections in January, but without a considerable number of rebels in Syriza’s ranks. Tsipras could open up the coalition to other forces like the old centre-left Pasok, or the new, but already failing, pro-media pro-troika To Potami. But this would probably bring more trouble than anything. This is no doubt Tsipras’ night – despite the long shadow cast by the rise of the neonazis and the shockingly high number of people who stayed at home (around 44% so far). Will his new government be able to navigate through a seemingly contradictory agenda of implementing the harsh measures of the 3rd bailout programme while mitigating its worst effects, as Tsipras has been repeating in the last months? Or is this just the beginning of the end? With creditors already knocking at the door for “quick and effective reforms” (read more austerity and privatisations, now), we will know pretty soon whether Tsipras’ bet will pay. Later today Greeks are going to the polls to elect their national parliament for the second time in a year, in a climate of frustration, disappointment and uncertainty. Most pollsters give the two main competitors, ‘newly refurbished’ Syriza, and the veterans of centre-right New Democracy (ND), head to head, within decimals from each other, around 27-31% of total votes. Neither party is projected to win an outright majority to govern, and with these numbers, whoever arrives first and wins the majority prize of 50 additional seats would need minor parties to govern. In January, Syriza won the election with a significant advantage of more than 8% of votes over ND, but established a government with the Independent Greeks to ensure a majority in parliament. Tsipras’ campaign message has been centred around the difference of going through the 3rd bailout programme with a left government with fresh faces, vs ending up with the old ‘corrupt’ parties in power like ND. Tsipras has also been adamant that a coalition with ND is to be excluded in any event, while let out hints that he might ally with Pasok and/or To Potami, if Syriza won’t be able to secure an outright majority. Meimarakis, new leader of ND and Minister of Defence from 2006 to 2009, has centred his campaign around the failures of Syriza to deliver anything ‘new’ and the ‘incompetent’ manner in which Syriza brought a disastrous deal home. He try to project himself as a sober and competent ‘father of the nation’ asking for Greeks to converge back on ND after their indulgence in supporting an ineffective radical left government. That analysts and observers in Greece could even talk of a ‘resurgence’ of New Democracy after the clear defeat of January probably says more about the disappointment with Tsipras’ several U-turns than Meimarakis’ questionable skill. We will only know on Monday whether we are witnessing a come-back of New Democracy or if the opinion polls are reflecting more the wishes of media oligarchs in bed with the creditors than the reality on the ground. Beyond the key issue of the distance between Syriza and ND, is it possible that perhaps both Syriza and New Democracy percentages have been adjusted upwards to cover up mounting discontent against the third bailout programme? Pollsters have spectacularly failed in the Greek referendum on the bailout in July, but many of them also significantly underestimated Syriza in the weeks before the January election. There is widespread speculation that polls are frequently “fudged”, and there is no doubt that the stakes in the struggle between technocracy and anti-austerity movements in Greece and Europe remain high. – How well the neo-nazis of Golden Dawn (GD) will fare; most polls place them steadily in third position, behind Syriza and ND, with 6 to 7%. Has GD performance been underplayed? Will they end up with double digits, as some supporters suggest? One poll from the independent online media platform The Press Project indicates that 1 out of 5 respondents who intend to vote GD, had voted Syriza in January. The increase in number of refugees arriving in Greece, coupled with anti-European sentiments fuelled by the frustrations over the capitulation to creditors, seem to have galvanised GD supporters, whose leaders are facing trial for several murders and other crimes. – The struggle within the anti-bailout left front has seen over the weeks growing numbers in favour of the communists of the KKE, with a declining trend for Popular Unity – the new party led by the Left Platform group which left Syriza in protest against Tsipras’ support of the bailout. KKE has maintained a solid position, with around 5-6% in most polls, confirming their performance in January. Popular Unity are projected to get around 3-4% (in some polls they go below the required 3% to get into parliament). Is there an interest in underplaying Popular Unity’s votes given their vocal and sanguine rhetoric against the bailout? Or does the difference between the two formations reflect the fact that KKE’s disengagement from the debates around bailout negotiations is paying off? It is also entirely possible that both formations are underestimated in polls, given their strong anti-bailout stance. It’s worth remembering that despite their strong criticisms of the bailout, KKE has sent clear messages that this is no time for Greece’s exit from the euro. Popular Unity seems to be more vocal about the possibility of Grexit, but they too over the weeks have often softened this position. – Pro-bailout parties centre-left Pasok (decimated by judiciary scandals) and To Potami (a new pro-troika liberal party full of media personalities) are likely to be decisive in the formation of a coalition government. “Fudged” or not, To Potami seems to be projected around the same percentages achieved in January (between 4 and 6% in recent polls), with a declining trend over the campaign period. Pasok has been boosted in last week’s polls (projected around 5-6% of votes in most polls), but it’s difficult to say whether that reflects potential former Pasok voters who supported Syriza in January who are now going back to their ‘home’, or Pasok’s considerable influence over the media establishment. The right-wing nationalist party of the Independent Greeks are often weighted below the 3% required to enter parliament, or just around it. Their far-right rhetoric has been considerably weakened by their involvement in the previous government. They are the only force clearly indicated by Tsipras as possible allies in the next government. – Outsider populist Centrists Union led by outspoken leader Leventis are surprisingly indicated around 4% in most polls, meaning that after running for several general elections, they might make it into parliament for the first time. The fact that a party often described as a ‘joke’ can receive such attention from pollsters is another sign of the general chaos and uncertainty marking the latest development in the Greek political arena. – Last but not least, voter turnout will be one of the most significant indicators of the state of Greek politics. A lacklustre electoral campaign conducted in a climate marked by disappointment and betrayed expectations might lead to large numbers of people choosing to stay home rather than “wasting” their ballot again. The extent of this will likely influence how much legitimacy the next government will have, and signal how deep the crisis of representative democracy is. The number of undecided voters in recent opinion polls remained high, in some cases well above 10%. It is unlikely that these numbers are anywhere close to capturing the real turnout. In January, 64% of voters cast their ballot, and it would be surprising if turnout this time will be the same or higher. Despite all the promises and assurances Greeks have heard in these weeks, it seems unlikely that the next government (probably a coalition one) will be able to pursue any significant autonomous political agenda beyond the harsh measures imposed by the 3rd bailout. Whether the numbers will allow for a stable government is all to be seen. Without noticing the irony, a couple of weeks ago Greek President Pavlopoulos said that he won’t allow another election until 2016. This update focuses on the Greek snap elections following PM Tsipras’ resignation, which are likely to be held on 20th September. As a summary of some of the agenda items of the newly formed Popular Unity – the Greek party created by Syriza anti-bailout rebels – I recommend an interesting media profile published today on their leader, Panagiotis Lafazanis. Popular Unity’s electoral programme advocates Grexit, partial cancellation of debt, restoration of national sovereignty via some form of socialist economy, and disengagement from NATO and Euro-Atlantic alliances – with an eye towards Russia. In programmatic terms, the differences with the well established Greek Communist Party (KKE) are minimal, and many of Popular Unity cadres were formerly in the KKE, including Lafazanis. The KKE has a solid grassroots organisation, including a workers’ association (PAME) and a youth wing (KNE). Popular Unity has to pretty much improvise along the way with elections just around the corner. Much will depend on mounting street sentiment against the bailout – or lack thereof. Popular Unity can capitalise on its vocal opposition to the bailout at the centre of the mainstream debate while its leaders were still within Syriza. Whatever analysts and politicians say, it will be very difficult to make any informed guess based on polls, as the elections have been called so quickly and new parties are appearing overnight. The controversial speaker of parliament Zoe Konstantopoulou has also announced a new party, which will possibly run as an ally of Popular Unity. While most analysts, backed by early polls, bet on Tsipras’ victory (but without an overall majority in parliament), the signals from Syriza ranks are not positive. Today 53 members of the party central committee resigned – these were largely part of Left Platform, the faction that is behind Popular Unity. 17 members had already resigned previously in disagreement with Syriza’s acceptance of the bailout terms, which means 70 out of 201 members have left the central committee. Reports on the ground indicate many local cadres are leaving Syriza. The central committee secretary general Koronakis also resigned on Monday. He is believed to have been close to Tsipras, his resignation has been perceived as a major blow to the majority line. Beyond the struggle for consensus on the anti-bailout left front, there are other trends that will be important to monitor. One is the contest between the new reincarnation of Syriza, moving rapidly towards the centre, and other pro-bailout parties – early polls indicate New Democracy trailing closely behind Syriza, but the performance of To Potami and Pasok will also be an important indicator of consensus for working within the eurozone institutional framework. Another important factor will be how well the neo-nazis of Golden Dawn will do – will there be a rise in their share of the votes given the failure of Syriza’s populist line and the fragmentation on the left? Will Golden Dawn capture some of the discontent with the capitulation to the creditors, compounded by economic crisis and the panic caused by the refugee crisis? There is also the possibility of low turnout as a manifestation of increasing disaffection with the democratic process. After all, many people might feel that Syriza’s electoral victory in January on a clear anti-austerity ticket, and the overwhelming opposition to the bailout in July’s referendum, have not led to any positive outcome in this direction.